The AMG SL65 Black Series which will be released later in 2008 will have a carbon composite roof structure with integrated roll bar. AMG have helped the car shed 266kg’s from the SL65’s weight. It should give the car a power to weight ratio of about 360bhp/tonne. The new engine will be a twin turbo 6.0-litre V12 which will now produce 670bhp which is a huge increase from the old 604bhp, thanks to bigger turbochargers and higher boost. The car will still have the same 737lb-ft of torque. We are not sure which gearbox it will have yet, critics say it is more likely to have the conventional five-speed torque converter automatic box. It changes 20 per cent faster than the SL63’s MCT wet clutch seven-speed. If it does land up being a version of the five-speed, the car surely won’t only have five gears though. 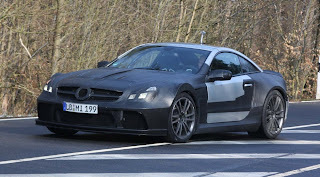 AMG promises that the changes to the SL Black Series will allow it to accelerate from 0-62mph in under 4.2 seconds. While the top speed will be electronically limited to 200mph. The Black Series sits significantly lower to the ground than the regular version and it will have a different adjustable suspension so the owner can personalize it for the track. There will only be 350 produced, although it might increase to 400 depending on the demand. It will cost just short of Â£200,000 ($400,000), auto insurance quotes aren’t known yet. Stop by WheelHQ.com and check out their large selection of Mercedes Wheels.